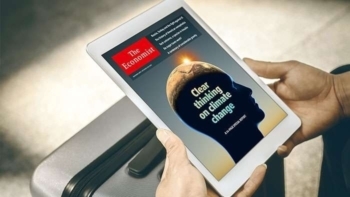 We have seen a lot of promotions for The Economist magazine over the last couple of years. These generally involve buying a one-year subscription with up to 13,200 Avios points thrown in as a bonus. Last Autumn there was an even better offer. 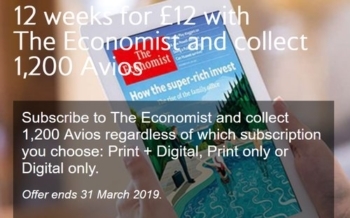 For £12, you could get a 12 issue trial subscription to The Economist, plus 1,050 Avios. At 1.16p per Avios, plus 12 issues of the magazine, it was a good deal. A new Economist offer has just launched on ba.com. In theory it looks even better than before – but it stinks. A great offer, yes? Er, no. This is a total cost of £100 for which you will receive just 1,200 Avios. This is a terrible incentive, especially compared to normal Economist offers for buying a full year subscription. Eligible members will collect 1,200 Avios for a Print, Digital OR Print AND Digital subscription when they choose the 12 week quarterly option. The 12 week quarterly Avios offer from 1 February 2019 until 31 March 2019 will only be available in the UK. To sign up, Eligible Customers must visit the dedicated webpage and click on ‘Subscribe now’, choose the subscription type (digital and/or print) and enter the 8 digit, British Airways Executive Club membership account number. In order to qualify for the Avios in this 12 week offer, the Eligible Customer must maintain a subscription for at least six months (26 weeks). This subscription is non-refundable, except if the customer is a resident in the EU, in which case the customer may cancel the subscription in the first 14 days and get a refund for any part of your subscription that has not already been delivered (for the print element) or published (for any digital element) before it is cancelled. Do read the small print here and give this offer a miss. If it does turn out to be a mistake, and the 26 week restriction quietly disappears, I will let you know. Sneaky sneaky. Especially when The Economist as a matter of course offers free 12 weeks subscriptions to groups I ‘ve been part of. It’s inertia selling. They rely on you not getting around to cancel as soon as terms allow you to. Remember the Readers Digest and all the offers on that? Similar model different audience. I plan on getting the Amex Platinum in the next few months (pending approval of course). I will be getting a Plat supp for Mrs Waddle. Am I able to get an additional card for myself? I’ve read online that Amex Aus have something called an “Account Card” which is effectively a second Plat for the cardmember and doesn’t count as a supp. Does that exist here? If not can I add myself as a supplementary cardholder and get a Gold/Green? Just to add, do not add the supps during your application or you miss out on potential bonus MR points.. Wait until your card is open, log into your account and select add card there. If you are lucky you will get an extra 5k points. Basically, there is a page on the Accor site to authorise auto-conversion of future stays. Some variants of the page will convert your existing points – if it doesn’t work your existing points, if under 4000, stay where they are. Try this https://s-leclub.accorhotels.com/convertAuto.action?lang=en&hasPromoCode=true&promoCode=FFPIBS01T then check back in 48 hours and see if your existing points balance has gone to zero. Clive, as Rob points out the problem with accor is variable pages which depend on your device and selected view. Hopefully the following will work for you directly or help guide you in right direction if pages you get are different..
Next page is dropdown menu with a list of all airline partners, select Iberia. This is where it gets odd and counterintuitivr. ..
You are then on final page that allows you to transfer the points to Iberia. The above is to transfer a fixed amount of points at one time. If you want to set up autoconvert then try Rob’s link. It wouldn’t load for me right now. If you have similar problem just leave a message and I’ll post step by step for auto convert tomorrow. O/T any idea best email to enquire about missing avios via Avis car hire? I would appreciate an Avios email if anyone knows one, for this same reason too. OT- Is there any way to use my Amazon GC Balance for Amazon Pay on non Amazon website? OT – not seen it mentioned, but just seen BA redemption finder site has changed name (rewardflightfinder.com) and now can check VS also. Yes, VS is going on too – doing a piece next week. I always assume that they are using an iPhone. The main reason that I gacve mine away was the random word changes. If anyone takes them up on this offer and the points post then please do leave a message here… I recall there being some strange wording on parts of the offer last time, but everything was as expected, and I’d be really surprised if it has changed.